On May 2nd, 1946, after an unsuccessful escape attempt at Alcatraz, the U.S. Marines were called in to restore order to the penitentiary under siege. The Battle of Alcatraz lasted for two days and two corrections officers and three inmates were killed. 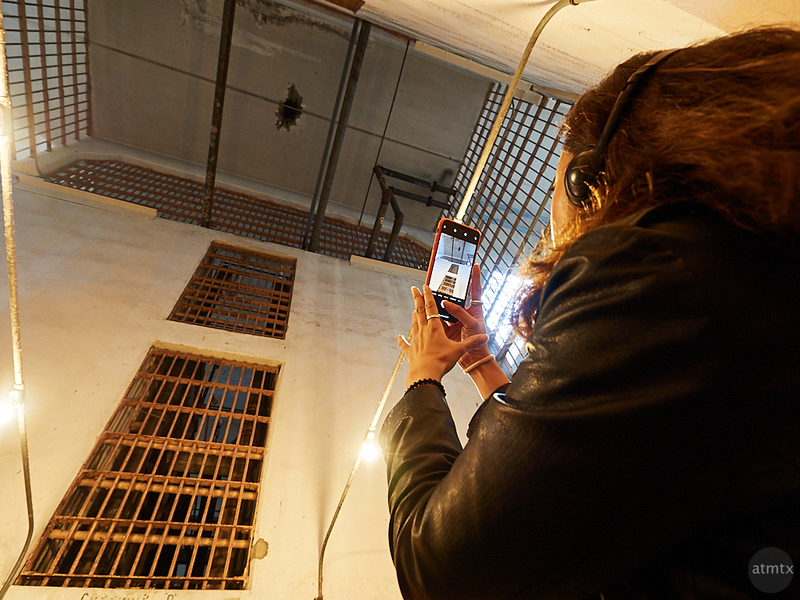 The Alcatraz entrance fee included a well done self-paced audio tour, available in multiple languages. It described life in Alcatraz as well as famous escape attempts. In dramatic fashion, the tour talked about the battle and how the Marines dropped grenades through a hole they made in the ceiling. The dark patch you see on the ceiling is a remnant of that battle and the actual grenade hole. This is one of my favorite photos from Alcatraz. I was documenting the ceiling, as the audio narration described the battle, when I noticed a woman doing the same. I quickly ducked down and made a picture of her shooting the ceiling. The wide-angle lens on the Olympus worked well to cover most of the room while including woman taking the shot. This is the last photo and post from my Alcatraz series. I ended up making a number of keepers, too numerous to post on the blog but I’m thinking of other options, for the future.